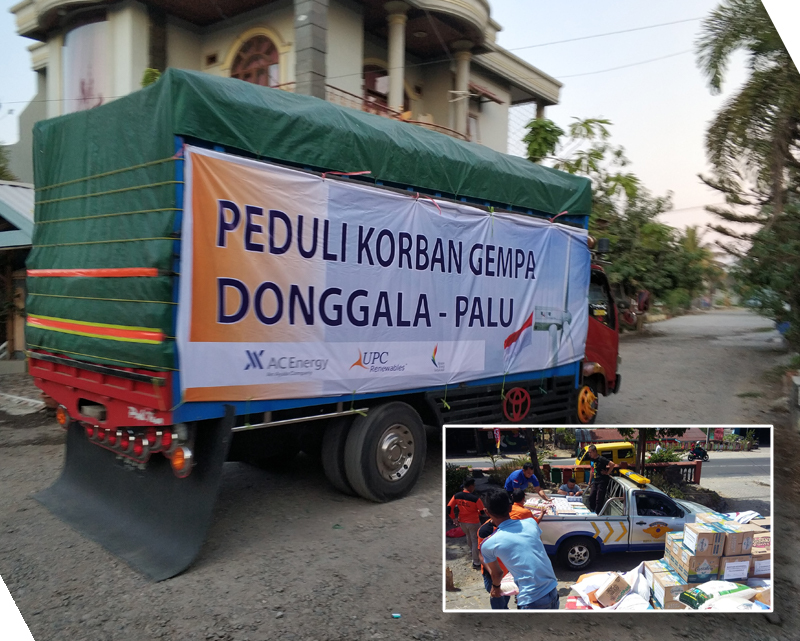 AC Energy and UPC Renewables Indonesia contribute to relief efforts following the earthquake and tsunami in Central Sulawesi, Indonesia. 24 October 2018 – The Ayala Group’s commitment to creating shared value and making a positive impact on society is at the forefront of its business strategy and operations. This is demonstrated in many ways, one of which is disaster risk reduction, a measure that bridges the areas of relief, recovery, and sustainability. AC Energy, the Ayala Group’s business arm in the power sector, shares this commitment by building resilience at each level – from the community to the local government. In Ilocos Norte, AC Energy subsidiaries North Luzon Renewables in Pagudpud and NorthWind Power in Bangui have been training local communities on disaster preparedness and response, including a team of certified first responders from the host barangays of Caparispisan and Caunayan. Now on its third year, the Resilient Communities Campaign has empowered community members across 32 barangays to take a proactive approach to disaster management. A team from North Luzon Renewables helps repair downed power lines in Barangay Caparispisan. North Luzon Renewables has been providing assistance to the communities of Pagudpud since it began operations four years ago. When typhoon Ompong battered the northern Philippines in September, the Pagudpud wind farm served as temporary shelter for some 83 displaced residents from nearby barangays. Emergency supplies were delivered to the LGUs before the typhoon hit, ensuring that essential provisions were in place even before they were needed. Relief efforts continued after the typhoon, with employees assisting the local electric cooperative to repair downed power lines in barangay Caparispisan and working with disaster risk reduction officers to assess damaged rooftops. AC Energy’s aid has extended beyond the Philippines. Less than a month after a 7.5-magnitude earthquake and tsunami struck Central Sulawesi, Indonesia, relief efforts continue with aid coming in from local and international sources. AC Energy, together with UPC Renewables Indonesia, its partner in the 75-MW Sidrap wind farm in South Sulawesi, made contributions to help survivors of the twin disasters. Through the Sidrap office, whose employees mobilized quickly to help with the relief efforts, the funds have been used to purchase and distribute food and supplies for survivors, many of whom have been displaced. Mitigating disaster and building resilience is a shared responsibility – from government institutions and the private sector, to civil society and community members. AC Energy, together with its partners, is committed to this responsibility – sharing knowledge and resources at home and in the region – so that those affected may rebuild empowered, resilient communities that are better prepared for the future.